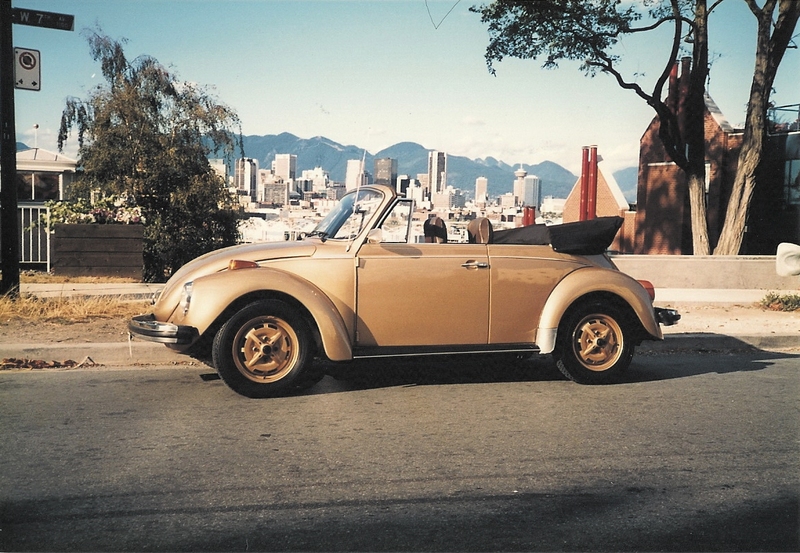 Purchased in 1986, this 1978 Beetle Cabriolet was purchased as a fun iconic car which was ideal for the mild Vancouver climate. 1992, purchased in Calgary. Disappointed in our first VW experience, we always had a soft spot for the car and then found this beautifully restored car in Calgary. My wife drove this car as her daily driver in Calgary and then in Vancouver after our move in 1993. Once our third child was born the VW was no longer practical and it became the ‘Nanny Car’ for a few years. Thereafter, I put it away for a future restoration. 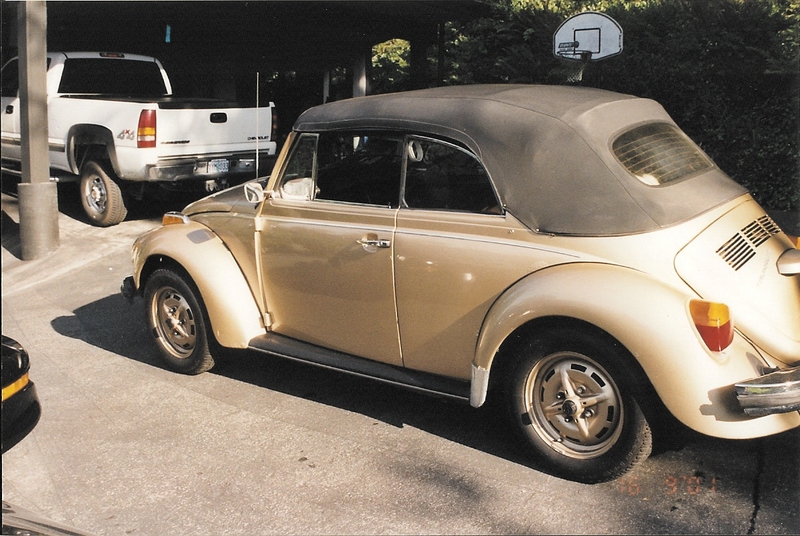 After about 10 years and occasional use, my friend Bruce, who was as crazy about VW as I was for Corvairs, convinced me that I should sell to him. 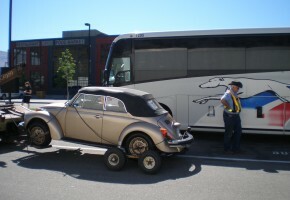 Bruce was going to drive the car back to Calgary from Vancouver so I was going to get it ready to go ! For the first time in 10 years the old reliable Beetle would not start and Bruce was not able to drive it back. Undeterred, Bruce didn’t want the fuel injection engine anyway and we organized for the engine to be swapped prior to his drive to Calgary. With the flights booked Bruce arrived with his new bride and planned for a wonderful top down camping trip back to Calgary. 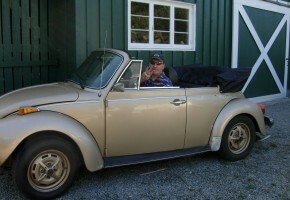 Following a 36 hour non stop effort the The Old Beetle Shop completed the swap and although a little late Bruce and Leslie headed off on their journey….25 minutes down the road a horrific screaming started from the engine. 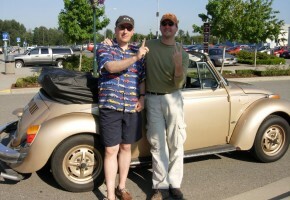 Limping back to The Old Beetle Shop, they left the car and resumed their journey with a rented car and a less than enthusiastic Leslie…wondering about Bruce’s odd attraction to this silly old German car ? With a simple fix of a pully the car was ready to go. Feeling bad for Bruce I told him not to worry, I would drive the car to Calgary instead of flying for a July business trip. So I got the temporary insurance and planned for a classic road trip for the 10 hour drive from Vancouver to Calgary over the Rocky Mountain route…an adventure ! I turned up with the car at home running perfectly with it’s headers and loud exhaust. My wife saw the car and said “I thought you sold the car”? I assured her it was sold and it was on it’s way to Calgary. Like most things automotive she just shook her head and knew she would not get all the details. The next morning I knew she was on a teleconference starting at 5 AM PST, I told her I was going to Calgary, which in simple terms was certainly the truth. At about 5:01 AM I started my journey and drove the first hour down the freeway with the car running like a dream. Stopping for gas and a coffee I began the first mountain pass on the Coqihalla Highway which is a spectacular drive through the Coastal Mountains of British Columbia. The car was running well and although the July temperature in the mountains dropped to 4 C, I refused to put up the top…I was going all the way. About 3 hours into the trip while going up a long uphill section there was a massive backfire? Increasingly the car started to sputter and backfire…I was getting nervous. Following the summit I started the downhill section and the car was still sputtering. Nearing the town of Merritt it finally stopped and I coasted for about 5 kilometers before pulling over just outside of Merritt. After a non productive change of the fuel filter I realized I was not going to be making the trip today. The following weekend…with my wife out of town (thankfully) I left early Saturday morning with our truck and a U Haul to retrieve the VW from Merritt. Following a 7 hour round trip the VW was back at The Old Beetle Shop with some degree of frustration. Again the fix was a simple issue, with a new rotator under the distributor cap. Everything seemed to run fine and hopefully this time we were ready to go. Finally we thought we were ready to go. 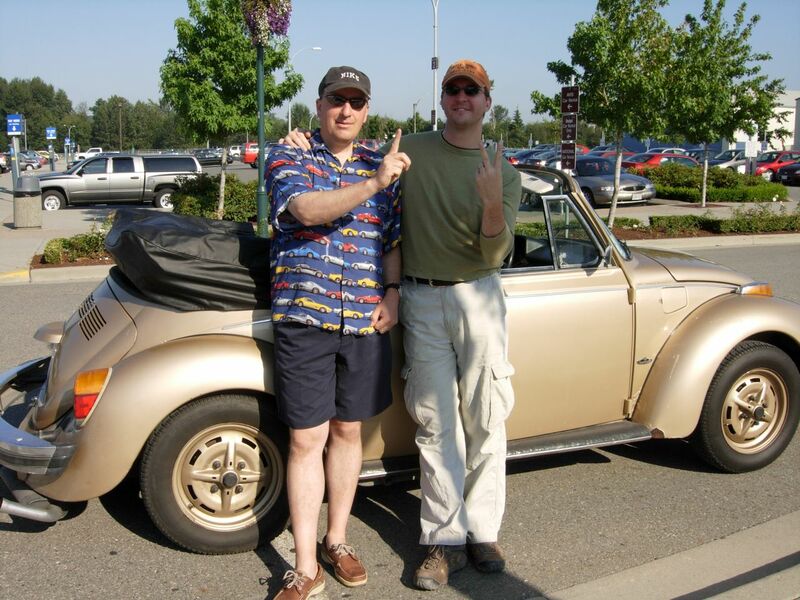 Bruce (without Leslie)this time flew from Calgary to Abbotsford where I met him with the car…ready to go ! Well GO it did…for the next 10 hours I was getting regular text messages from Bruce as he hit milestones along the route. The final message was Bruce reporting that he was cruising into the final run from Banff to Calgary at 160 km/hr. 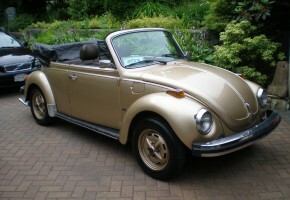 Finally we delivered after 5 attempts the VW back to Calgary where we had bought it 14 years earlier. After a year in Calgary where Bruce drove it as his daily driver during the cold Prairie winter, he announced that they were now moving to British Columbia to purchase a business in Cowichan Bay, Vancouver Island. Recently with Bruce and Leslie’s expecting their second child, he called to offer to sell the VW back to me…after a brief moments thought…I declined. 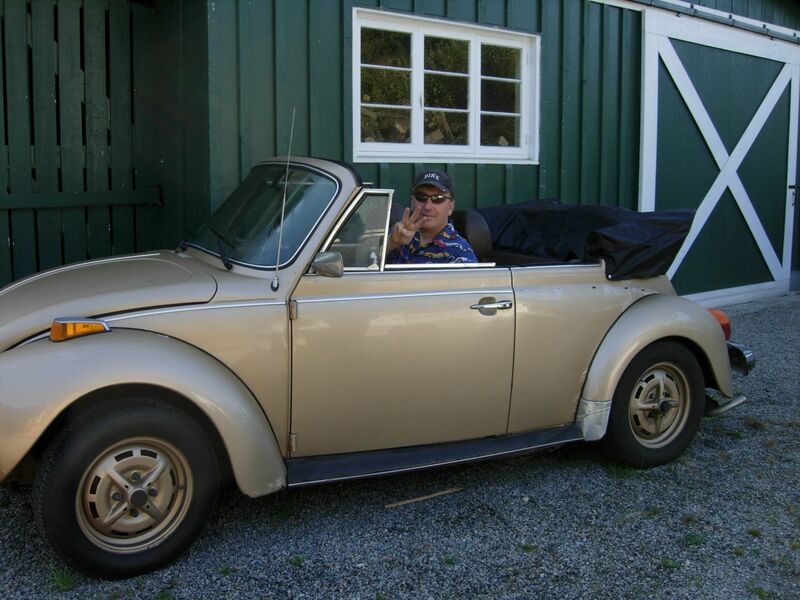 The VW SAGA was over for me….